Storm the Dremora defenses to reach the Endless Stair. The Reaver Citadel — Help take over the Reaver Citadel. King Dynar has devised a two-pronged attack to take control of the Reaver Citadel. It utilizes the old Fighters and Mages Guilds' halls located in this ancient Nirn city. Find a way into the Reaver Citadel. Locate the ward key and gain access to the Fighters Guild. Recover the portal stones and activate the Mages Guild portal. Enter the Citadel Pyramid and defeat Valkynaz Seris. While the Fighters Guild troops use the secret passageways to enter the Fighters Guild hall, I need to find the ward key and deactivate the wards that seal the hall. But first, I'll need to find my own way into the city. I recovered the Fighters Guild Ward Key. Now I should use it to deactivate the wards and open the guild hall door. 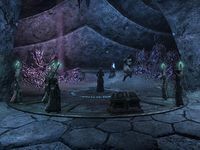 While the Fighters Guild battles the Dremora, I need to go to the upper city and locate the Mages Guild portal stones. In order to activate the portal in the Mages Guild Hall, I need to collect the scattered portal stones. Once I set the portal stones back in place, the mages should be able to activate the guild hall portal. Objective Hint: Now that I collected the portal stones, I should enter the Mages Guild Hall. Now that the Mages Guild Hall portal has been activated and the mages have teleported through, I should talk to Vanus Galerion. I need find the entrance to the pyramid so I can confront the leader of the citadel and obtain the key to the Labyrinth. 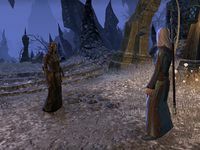 I reached the entrance to the pyramid, but others have arrived before me, including the Dremora, Lyranth. I should talk to her. Now that Lyranth opened the door, I should enter Valkynaz Seris' stronghold and confront the commander of the Citadel. I entered the pyramid stronghold of Valkynaz Seris. Now I need to find the Valkynaz and end this. The stronghold is clear, and Valkynaz Seris is dead. I should find the key to the Labyrinth. We'll need that key to enter Molag Bal's inner sanctum. Perhaps the key is in the Valkynaz's chest. I collected the key that opens the way to the Labyrinth. Now I should exit the pyramid and find Vanus Galerion. With Lyranth now in charge of the Citadel, we have safe passage to the Labyrinth and the Endless Stair beyond. And I have the key that gets us inside. I should speak to Vanus Galerion and see how he and King Dynar want to proceed.